Four Rings Silver Tone Ring. 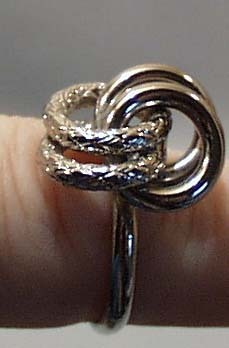 This is a most unusual ring. There are four 3/8" rings on the top of this ring. Two of these rings are smooth silver tone finish and very shiny. Entwined in these two rings are two more 3/8' rings that have a etched design. These are four 3/8" circles on top of the ring. IN mint condition and probably from the 1980's. Size 6 1/2 but it is adjustable and probably could expand another quarter size. Items Similar To "Four Rings Silver Tone Ring"